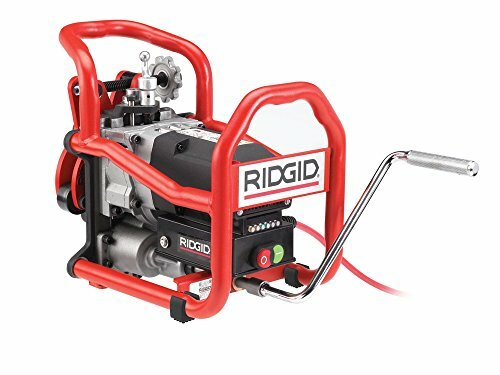 The RIDGID B-500 Transportable Pipe Beveller produces high-quality bevels in minutes without flames or sparks. The compact design quickly mounts to pipe 4-inch and up with a maximum wall thickness of 1/2-inch or flat plates up to 1/2-inch think, and creates consistent bevels in a single pass. The speed indicator lights optimize the operator's pace. The adjustable landing can be set between 0 and 3/16-inches in fitness increments of 1/32-inch. The pipe beveling machine has the capacity for 30, 37-1/2, and 45-degree bevels due to the interchangeable heads (optional 30 and 45 degree heads sold separately). In seconds you will have high-quality bevels that are cool to the touch. RIDGID 49298 includes: B-500 pipe beveling machine, T15/S7 Torx Wrench, Spanner Wrench, 5/16 Hex Wrench, 1/2 Drive ASM Crank, Operator's Manual, and 37-1/2 Degree Cutter Head w/ 6 Inserts, (1) Anti-Seize Grease, (8) Screws. Since 1923, RIDGID has remained the symbol of certainty to dedicated professionals of the expert trades. Every tool that bears the RIDGID brand is engineered to the same high standards of quality, strength, and endurance, as was that first heavy-duty pipe wrench more than 80 years ago. View More In Beveled Washers.